Since 2009, SRPC has regularly offered up to 5 sessions each year to the Scout movement, and every opportunity is filled quickly. 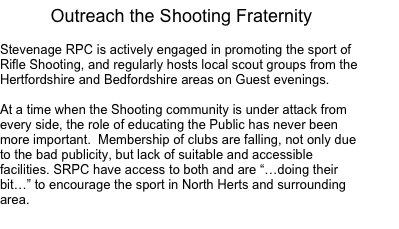 We would like to offer more, but are constrained by both the duty to our members (who enjoy the competitive sport and commit to Competition deadlines) – and the Guest evening limitations imposed by the Home Office. Our members volunteer their own time to organise and support these evenings, where we can host up to 15 guests (Scouts and Leaders) in each evening. 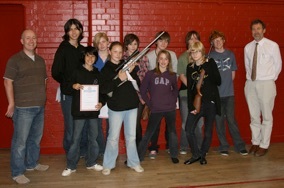 The Club offers a safe introduction to the sport first by covering the safety aspects of shooting – and then with individual instructors for each Scout, and under the watchful eye and control of the Range Conducting Officer, provides opportunities during the evening session to try a selection of firearms on the firing range. Typically this might be both Prone Rifle, and Gallery Rifle. 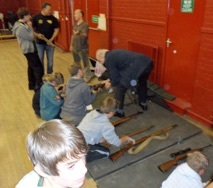 Within this safe environment the Scouts can also handle and experience different firearms at first hand. 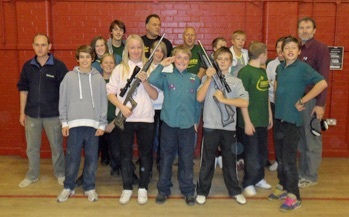 “It is rewarding to be able to introduce young people to this sport which stresses body and breathing control – and concentration – you should see the smile on their faces when they come out of the range with their targets !” Mark went on to say. If you would like to take advantage of one of these opportunities, why not contact us ?